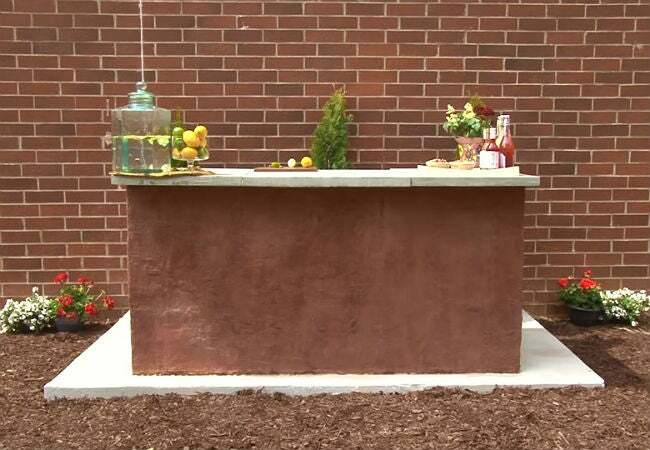 A backyard bar with a sleek concrete countertop that requires no special masonry skills? It's possible! So, take the party outside—we’ll show you how. Whether you’re hosting a summer barbecue or entertaining Christmas carolers around the chiminea, an outdoor bar provides a welcome surface for drinks and food and sets the scene for an outdoor living area. But the right bar can be a compromise: Professionally constructed masonry bars are statement structures but budget-heavy, and store-bought wicker bars tend to be ready for the landfill in a few short years. 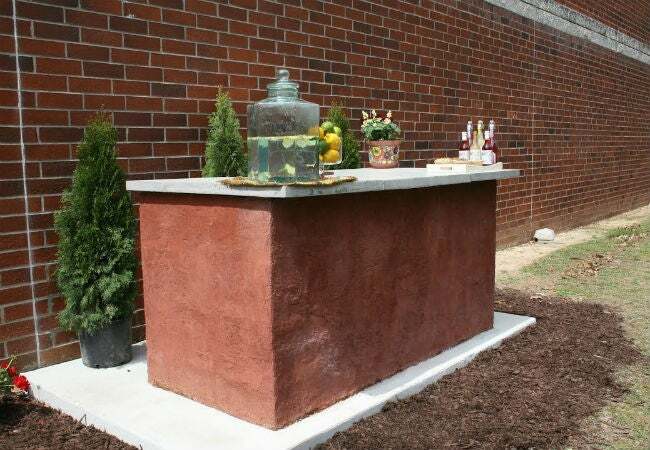 This trendy stucco-sided outdoor bar, on the other hand, is both sturdy and budget friendly. It’s a permanent feature that any handy do-it-yourselfer can make, thanks to its dry-stack concrete block construction, which requires no special masonry skills. Plus, this bar’s concrete countertop is durable enough to serve in any season. So, what are you waiting for? Get started building an outdoor bar that will provide years of entertaining pleasure. All you need is a little help from the concrete professionals at Quikrete. 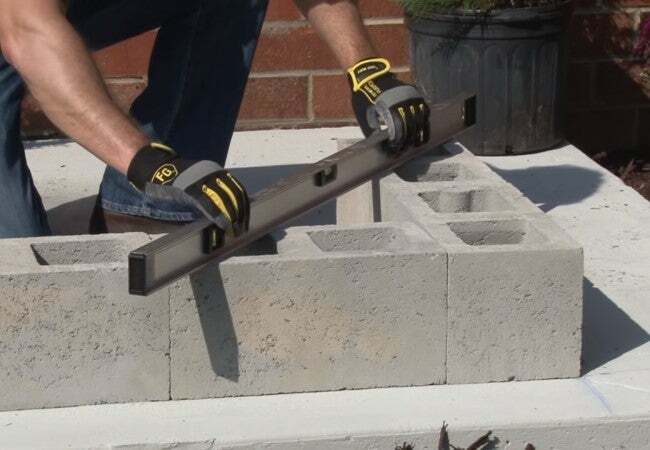 Lay the blocks on a level concrete slab. Grass, sand, and gravel have a tendency to settle and shift over time, so they don’t provide an adequate base for this entertainment bar. If you don’t have a concrete slab, consider pouring one following the instructions in this slab-pouring video from Quikrete. Start with a perfectly level surface. Uneven areas on an existing concrete slab can throw the entire bar out of kilter. Dips in the slab caused by surface flaking should be filled with a quality concrete filler, such as Quikrete’s Vinyl Concrete Patcher, before you start laying the blocks. Alternate the block pattern. For strength, don’t place blocks directly over blocks, with the joints aligned. Instead, stagger the joints on each successive course of blocks in a running bond pattern. Fill the entire base with blocks. Since no mortar is used, the bar gets its structural stability from its solid block base. Avoid placing blocks only along the exterior walls of the base and leaving the inside area empty. Tap blocks into place when necessary to make the sides of the walls even. Use a rubber mallet rather than a regular hammer, which can chip the blocks. Build to your desired height. A standard bar height is 40 to 44 inches from the ground, but you might choose to make yours just 30 inches tall if you intend to use it as an eating surface surrounded by standard chairs. When designing, know that concrete blocks are typically eight or 16 inches long, and they come in four-inch, six-inch, and eight-inch heights. And remember: The countertop will add another two inches to the bar’s total height. After building the base of your outdoor bar from blocks, it’s a snap to apply a durable coat with Quikrete’s Quikwall Surface Bonding Cement. Quikwall contains fiberglass-reinforced Portland cement, and a single coating provides a stunning stucco finish, so the block base will actually be stronger than being built using mortar. 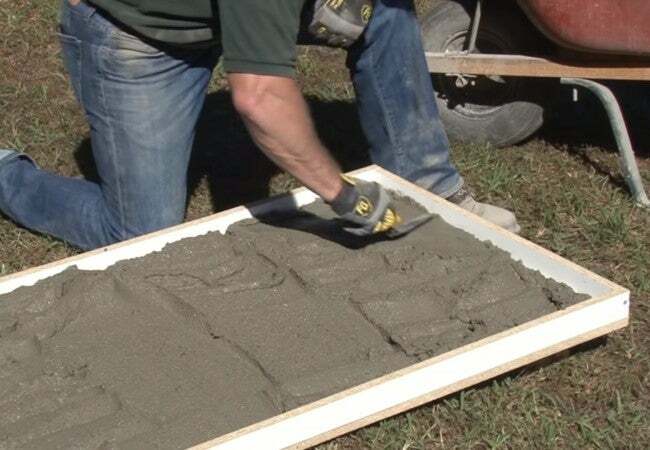 Just trowel on an even, 1/8-inch-thick coat over the blocks as shown in Quikrete’s bar-constructing video; when mixed as directed, a 50-pound bag of Quikwall will cover 50 square feet. Be sure to saturate the blocks (just spray them with a hose) before you apply the coating, because dry blocks tend to draw moisture out of the coating too quickly, which can result in a cracked surface. 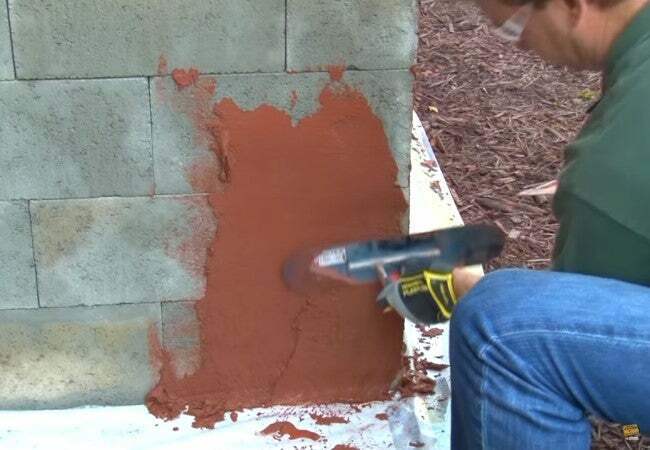 Quikwall will naturally cure to an attractive light gray, but just add Quikrete Cement Color as you mix the product and you can achieve a splash of natural color: terra cotta, buff, charcoal, brown, or red. Adding more or less pigment to the water will allow you to create your own custom hue. Ensure a uniform color on the entire bar by measuring all ingredients and using the same ratio for each successive batch. With the base finished, all that stands between you and a night of outdoor entertainment is creating and installing the concrete countertop. Since a countertop should be strong, smooth, and beautiful, use high-strength concrete. 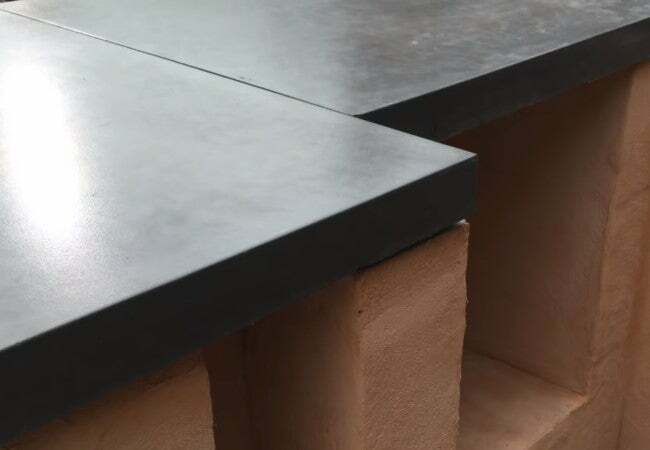 Quikrete’s Countertop Mix is designed specifically for casting these work surfaces, and it contains super-plasticizer additives, which prevent air bubbles and create a smooth finish. Don’t skimp on mixing time. This mix needs a full five minutes of mixing to ensure all ingredients are thoroughly blended. After pouring the sections, give them at least 18 hours to cure before removing the forms and sanding the rough edges of the countertop. Get assistance. Setting the slabs requires two or more people to lift and position the sections on the block base. To stabilize the slabs, considering applying globs of silicone caulk (half-dollar size) to the bearing points on the base before positioning the slabs. The silicone offers a measure of cushioning and will keep the slabs in place. Whether or not you seal the concrete countertop is up to you. After all, this surface, like the concrete blocks and Quikwall coating, is already weatherproof. Base your decision on your aesthetics and your tendencies. Left unsealed, the countertop will naturally develop a beautiful patina over time, but its porous surface may also absorb stains from spilled red wine, splattered barbecue sauce, and the like. Coating your finished top with a high-quality sealer, such Quikrete Concrete and Masonry Gloss Sealer, will help preserve its original appearance and add an attractive high sheen at the same time. Finally consider coating with a food safe wax for added protection.